Ken Goss, a senior in computer science and computer engineering, poses with the S&T Observatory’s 16-inch diameter telescope. An educational asset has reopened to the public, thanks, in part, to the passion and dedication of one Missouri S&T student. Ken Goss hosted the S&T Observatory’s first Visitors’ Night in over two years on Aug. 20, 2015, giving over 100 community members, faculty, staff and students the chance to get an up-close look at Saturn and its rings through the university’s 16-inch diameter telescope. A senior in computer science and computer engineering, Goss plans to host public viewings at least a few times a semester until he graduates in May 2017. The next viewing will be of the Pleiades star cluster at 7:30 p.m. Monday, Nov. 9. The observatory is located at 1550 N. Bishop Ave. (Highway 63 North), adjacent to the university’s Stonehenge. 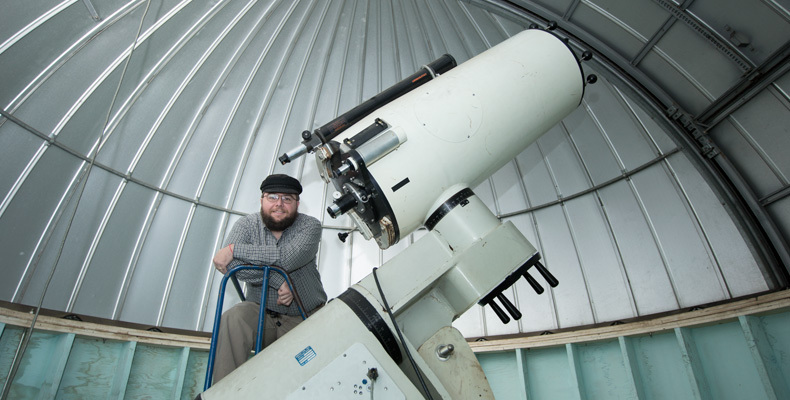 Goss and Russ Summers, a research electronics technician in the physics department, spent the summer cleaning up the observatory and getting the telescope operational again. But, it was a chance encounter that even got them to that point. 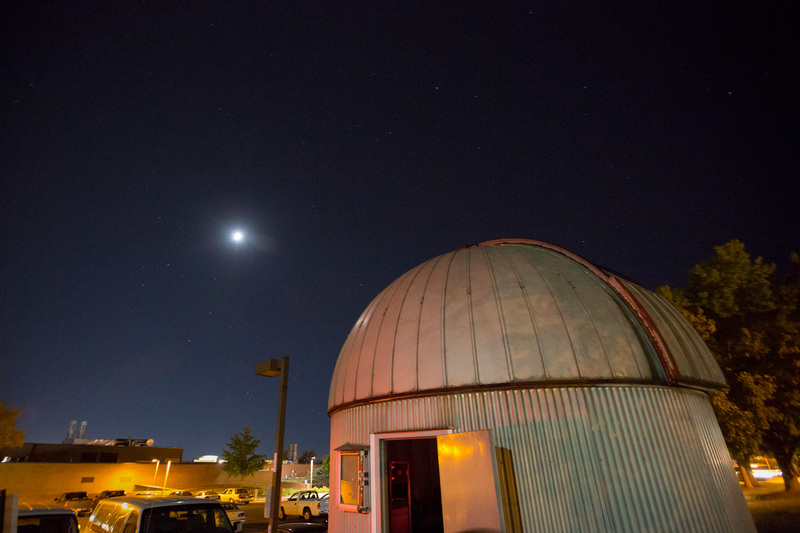 The physics department, which owns the observatory and its telescope, had been looking for someone to take over Visitors’ Nights since John Schmitt, associate professor emeritus of physics, retired in 2013. Schmitt taught astronomy and ran the observatory for decades. Not long ago, Paul Parris, a professor of physics, discovered his neighbor who often stargazed in his front yard using a personal telescope, was an S&T student. One night when Parris took his trash bin out to the curb, he approached his neighbor about the observatory. Parris’ neighbor, Goss, says he was very interested. Parris talked to Dan Waddill, chair of physics, and within weeks it “was a done deal,” says Goss. A view of the night sky above the S&T Observatory. A native of Lebanon, Missouri, Goss says he grew up with a “nascent interest” in astronomy. “I’d go out and look for different things at different times of the year.” But, he says his interest has grown in the last two or three years, since he bought a telescope – the same one Parris saw him using. He now considers himself an amateur astronomer. A Messianic Jew with a deep interest in religion, Goss says he is most interested in the historical connections between astronomy, astrology and agriculture. “A few years ago I noticed there were writings in the Bible about particular constellations, and I’m thinking, ‘OK, what’s up?’ Judaism hasn’t been, at least in recent times, as obsessed with astrology as other traditions. So there must be something else to it,” he says. “That’s when I started recognizing the agricultural cycles. “And so, in particular regard to the Bible and the Torah, in Israel, back in those times, the rising and setting of those constellations would mark when the rainy season was going to begin,” he adds. Goss is what you would call a “non-traditional” student. He and his wife, Heather, both majored in music education at Truman State University. He earned both bachelor’s and master’s degrees there, and student-taught music in Missouri’s Kirkwood School District. Then the economic recession came, and the job market crashed. Goss decided to go back to school at S&T to become a computer engineer. “I was afforded the opportunity to retool my skill set,” as he says. He never thought he would be running a university observatory. Yeah, Ken!! It’s great to see the variety of opportunities afforded to students at S&T. I’m pleased Ken was willing to accept the challenge and bring joy to the public through his works! I pray you continue on with vigor! Dr. Schmitt was an awesome instructor and I’m sad to hear I was one of his last students. Though the only thing I remember most about this observatory was the terrible light pollution, they really should relocate it or build a better one. IIRC we had better pictures with the smaller unit we borrowed from Dr. Schmitt/physics and took into the national forest and it was only about half the light gathering power.